Ananka's Diary: Keep Warm This Winter with Rat Fur! first eating rodents, now wearing them? YUCKY! Yeah, i agree with montana irregulars: is this "many uses for mice & rats" week? nevertheless, it's all quite interesting! if i had enough money, i'd certainly buy one of those outfits just to gross my friends out! I'm not going to wear rats anytime soon, but I wonder what sort of part they play in the ecology of the wetlands . . . they must do something, otherwise they wouldn't be there. Excellent question, GE, but I believe nutria are what's known as an "invasive species," (much like pythons in the Everglades) and weren't originally part of the wetlands ecology. I personally do not believe that it is O.K. to murder animals to make in coats or vests or ponchos or whatever and I would not wear one. But if they are pests and they are more helpful warming your torso then I guess they could be used for that....As long as do not become endangered or extinct. And also The killing should be done humanely and not out of cruelty or spite. 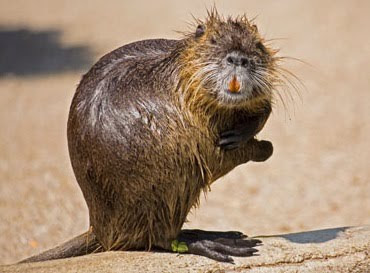 we could eat the nutria. I don't wear fur personally, but people have for thousands of years. And we've worn worse things... Vest made of the fur of your dead dog? I like rodents, but not everyone does... So I'm not too sure how to react to this. I don't think it is right to wear the nutria fur. I would never buy the coats. But refusing that brings up so many different points; should we wear silk or snakeskin? I suggest that we kill them, and feed them to the poor in Africa! Since fur of any kind is probably the second-worst thing for my various and sundry lung disorders, I don't wear it, and I try to stay several yards away from anyone who does. Julia Branches: Silk, I'm ok with. It's from bugs. I really have no problem squishing bugs (even less when you get something cool like silk in doing so) although I'd rather make my brother do it. As for snakeskin...I just have to ask, do I really *want* to wear it? No offense to snakeskin fans, but I think the stuff is the ugliest material since leopard print. In NZ, there is a rather good possum fur industry. Possums are an indroduced species there and have become pests, decimating swathes of flora to a point where the native fauna don't stand a chance. As an Aussie, in whose home country possums are a protected species, the idea of wearing one was a bit of a shock to me at first. But if the numbers have to be culled to protect the environment, you might as well get something out of it, I suppose. And the possum fur jumper I bought for my mum is the warmest thing in her wardrobe, apparently. Wearing the fur of any animal is revolting in my personal opinion, I don't want to be a reaver (firefly reference)! High fashion often has the tendency to be ridiculous. Can you believe women spend thousands of dollars, get in debt even, to wear things like that? It's just sad. looks like it would be itchy to wear. But i think it should be OK. If there destroying our planet, we should detroy them. there dang ugly. Most of u peoples are so narrow minded, if u were frozen to death and hungry u'd wear any fur and eat any meat including urban contagious rats not speaking about nutria meat which is actually very healthy delicacy and btw where they come from originally they are part of the ecosystem, so open your mind and don't think about what's useful for you only. Most of pests have become pests because we humans have ruined natural and original ecosystems. Have we humans been of any use to poor animals ever? Try to look at it from another angle! Another thing to think about for hypocrites is your shoes arent they made from leather do u think it grows on trees? If u were cold ud wear anything as I mentioned earlier. What about cows, using them for milk their life time, eating their babies , eating themselves and then using their leather? I personally find it yuckier. Not saying that I am a vegetarian, but i'd rather have a yucky rodent then poor cow on my plate:) Cows are real intelligent animals too, some of them smarter then some of u as a matter of fact. For curious ones - u could believe me, it's like any other fur if u're allergic to fur yes u'll be itching otherwise not.